Marcia The Art of Photography Gallery Blog: Is Your Halloween Green? Halloween is one of those great American traditions. It's also an opportunity to help our families think green. Here is a short list of things you can do make this Holiday both fun and eco-friendly. * Intersperse Halloween themed stoneware with color coordinated dishes for a scary look that is re-used year after year. My favorite coffee mug says Eek! in black, yellow and orange allowing me to mix it and a couple other Halloween themed pieces with the dishes I already have. * Give the kids black colored gift bags to collect their tricks and treats. That plastic pumpkin usually gets thrown away after one use, so why not try a gift bag in basic black that can be used later with a few embellishments for an elegant holiday wrap. 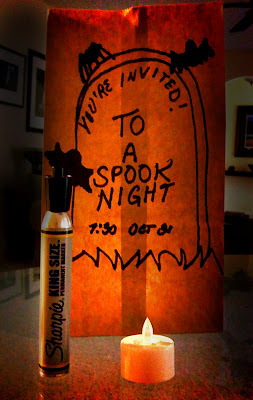 * Recycle your Halloween Party invitations. Write your invitation directly on a brown paper bag and ask your guests to bring the bag to the party. Drop an LED candle light into each one and - Voila! Instant luminarias! * Give out candy with a conscience. Sweets like Endangered Species Chocolate Halloween Treats are made of sustainably-grown and 100% ethically traded dark or milk chocolate, unbleached beet sugar (for sweetening), and only all-natural ingredients.